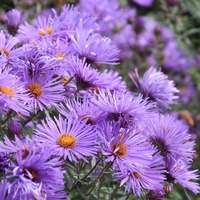 Symphyotrichum novae-angliae (formerly Aster novae-angliae L.), commonly known as the New England Aster or Michaelmas Daisy, is actually a flowering herbaceous perennial plant in the Asteraceae family which also includes yarrows, chrysanthemums and sunflowers. 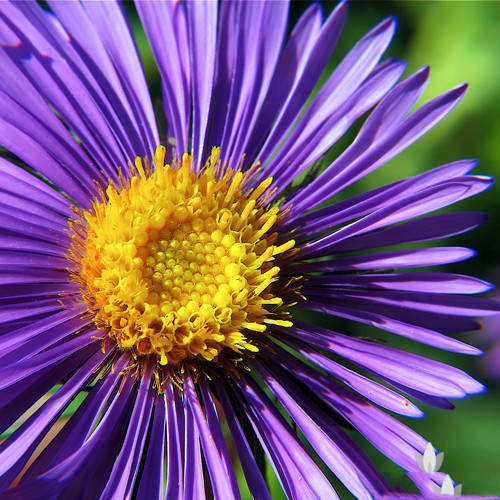 The Genus Aster contains over 600 species and thousands of hybrid varieties providing a wide choice to pick from, as they all vary in habit, height, flower color, leaf shape and growing conditions. The plant is native to almost every area in North America east of the Rocky Mountains, but excluding the far north of Canada as well as some of the southern United States. The plant was introduced to Europe in 1710; a common garden escape, it has naturalized along roadsides and on disturbed ground. 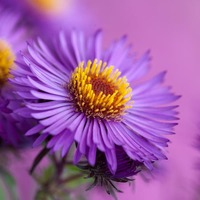 Few of the popular common names of the plant are Michaelmas daisy, New England aster, New England daisy, Hairy Michaelmas daisy, New England American-aster and hardy aster. 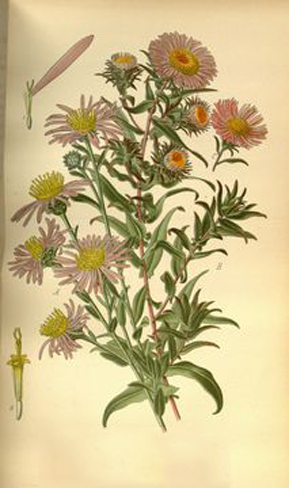 The genus, Symphyotrichum, is derive from the Greek symph meaning coming together or grouped (think symphony), and the Greek thrix meaning hair and a possible reference to the thin flower rays or its anthers. The specific epithet is simply the Latinized translation of New England. 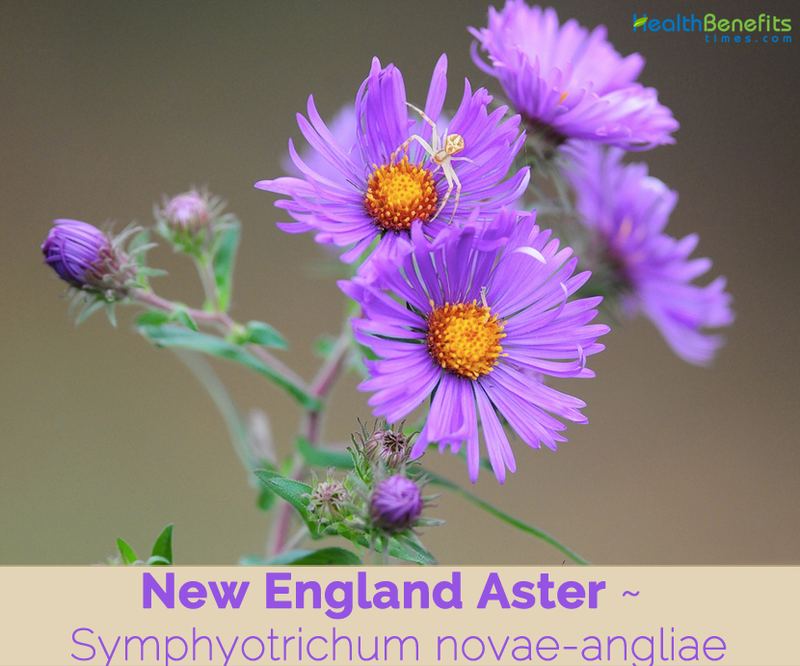 New England Aster can be variable in terms of its size, color of the flowers, and other characteristics. This plant has attractive flowers with a long blooming period, but it often appears messy by the fall as a result of drought, insects, and disease. Leaves are mostly lance-oblong, some widest above the middle, 1 to 4 inches long, ½ to 1 inch wide, mostly toothless, stalk less, tapering to a pointed or rounded tip, the base with a pair of lobes (auricles) that extend around the stem and clasp it. 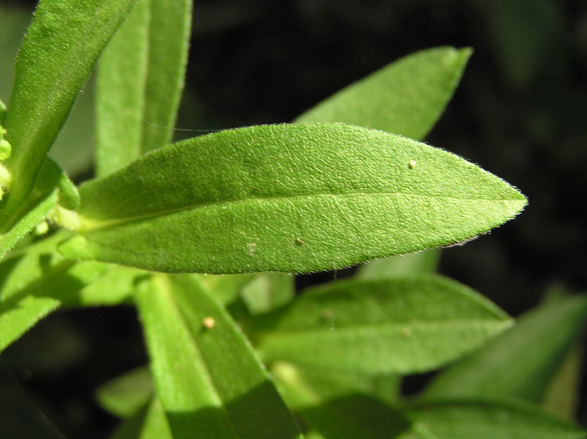 The upper surface of the leaf is rough while the underside is more softly hairy. 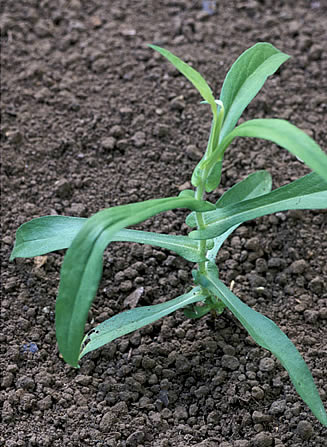 Basal leaves are more spatula-shaped and wither away by flowering time along with the lower stem leaves. Upper stem leaves are often densely packed. Flowers are 1 to 1½ inches across with 40 to 100 narrow petals (ray flowers) and a golden yellow center that turns reddish purple with age. Ray color is purple to rose pink. 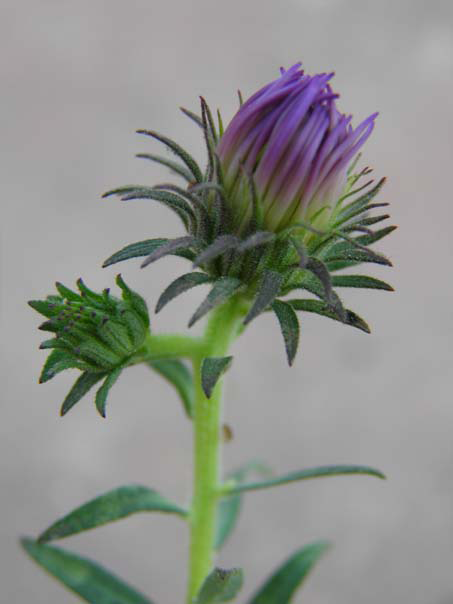 The bracts (phyllaries) surrounding the base of the flower are in 3 to 5 layers, very narrow, green to purple-tinged, widely spreading, and the outer phyllaries covered in short glandular hairs. Flower stalks are up to 1½ inch long with a few narrow, leaf-like bracts below the flower. 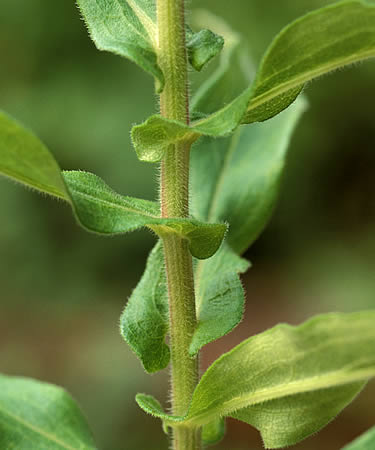 Stalks and bracts are covered in a mix of glandular and non-glandular hairs. Flowering normally takes place from September to October. 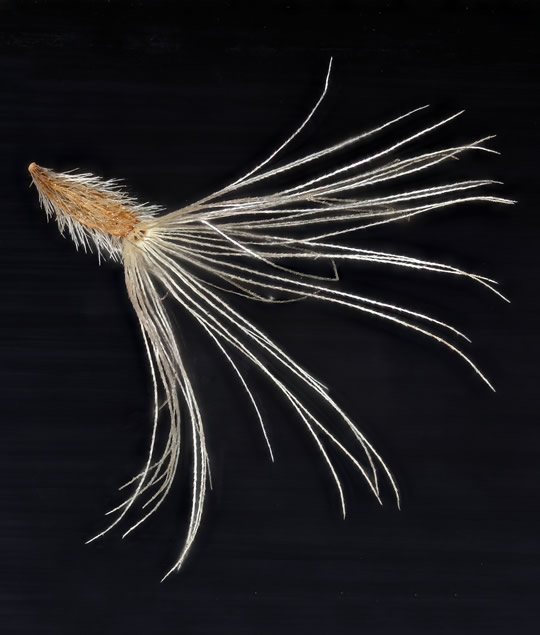 Flowers are followed by dry, hairy seed with a tuft of light brown hairs to carry it off in the wind. 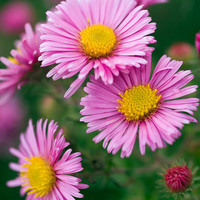 Fast-growing, upright and vigorous, New England Aster ‘Andenken an Alma Potschke’ (Aster novae-angliae) features masses of large, daisy-like, bright rose-pink flowers, up to 2 in. wide (5 cm) with sunny yellow center disks. Blooming for 6 weeks or longer, from late summer to late fall, this eye-catching beauty easily enlivens any sunny corner of the garden. Native to North America, it is easy to grow, long lived, brings cheerful fall color and is a great source of nectar for butterflies. 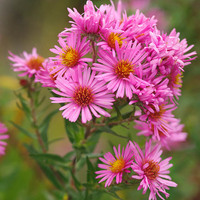 Very distinctive New England Aster variety, ‘Barr’s Pink’ (Aster novae-angliae) features masses of unusually large, rich lilac-pink, many-petaled flowers, 2.25 in. across (5.5 cm), with a strikingly prominent golden center disk. Initially golden yellow, the disc gradually ages to a beautiful pale bronze, becoming a prime feature of the plant. This eye-catching beauty readily invigorates any sunny corner of the garden. Native to North America, it is easy to grow, long lived, brings cheerful fall color and is a great source of nectar for butterflies. 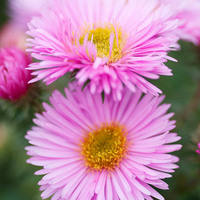 Vigorous and statuesque New England Aster variety, ‘Harrington’s Pink’ (Aster novae-angliae) features masses of subtle, clear pink flowers, 1 in. across (2.5 cm), densely packed with fine ray petals. Native to North America, it is easy to grow, long lived, brings cheerful fall color and is a great source of nectar for butterflies. It is the winner of the prestigious Award of Garden Merit of the Royal Horticultural Society for its noteworthy qualities. 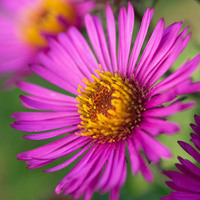 Truly magnificent New England Aster variety, ‘Lou Williams’ (Aster novae-angliae) features abundant, large, daisy-like, rich ruby to purple-red flowers, 2.25 in. (5.5 cm), with broad petals. They bloom for weeks from late summer to late fall, on strong sprays that do not require staking. Native to North America, it is easy to grow, long lived, brings cheerful fall color and is a great source of nectar for butterflies. 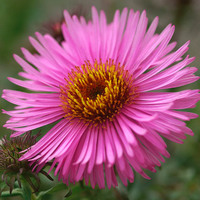 Tall and popular New England Aster variety, ‘Pink Victor’ (Aster novae-angliae) features masses of semi-double, medium pink flowers with golden yellow center disks. 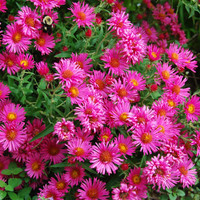 Blooming for weeks from late summer to mid-fall, this eye-catching beauty readily enlivens any sunny corner of the garden. Native to North America, it is easy to grow, long lived, brings cheerful fall color and is a great source of nectar for butterflies. 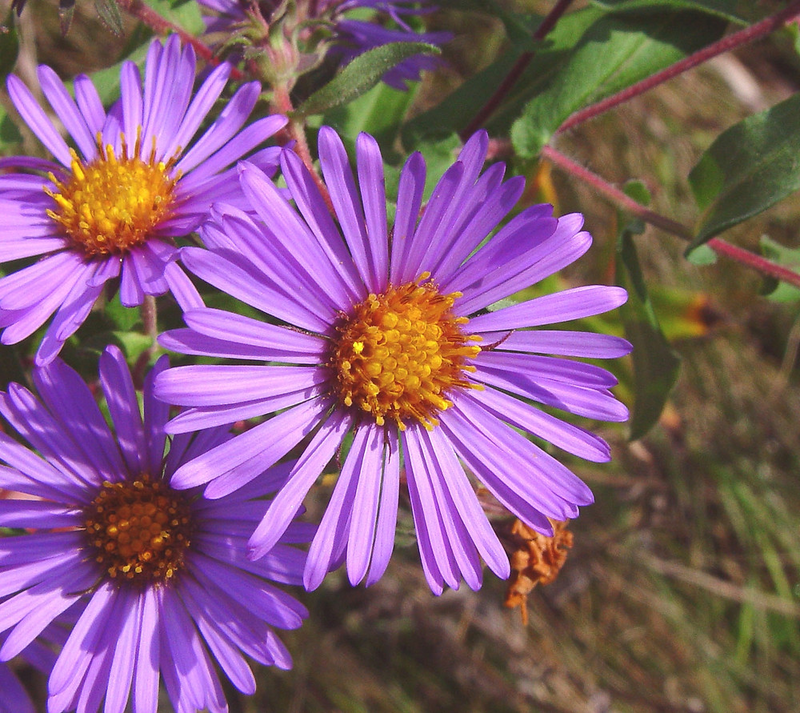 Highly floriferous, New England Aster ‘Purple Cloud’ (Aster novae-angliae) features masses of large, daisy-like, purple-blue flowers with sunny yellow center disks. Born on strong, sturdy stems, the attractive blossoms can fully cover the plant. The plant is native to North America; it is easy to grow, long lived, brings cheerful fall color and is a great source of nectar for butterflies. 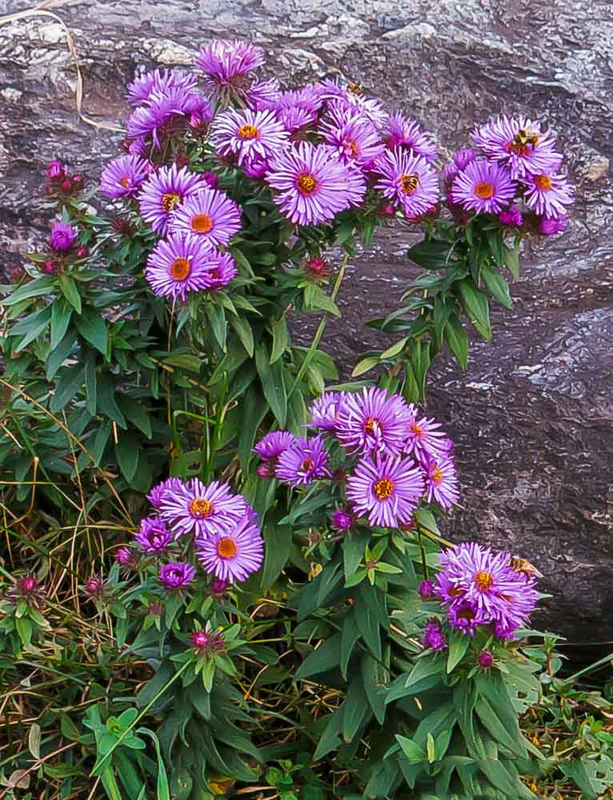 Very attractive dwarf variety, New England Aster ‘Purple Dome’ features masses of semi-double, daisy-like, deep purple flowers, 1.5 in. wide (4 cm), with sunny yellow center disks, which can fully cover the plant. The plant is native to North America and is easy to grow, long lived, brings cheerful fall color and is a great source of nectar for butterflies. The plant features masses of large, delicate, pale, rose-pink flowers with golden yellow center disks. The plant is native to North America; it is easy to grow, long lived, brings cheerful fall color and is a great source of nectar for butterflies. The plant grows up to 4 ft. tall (120 cm) and 20 in. wide (50 cm). The plant features abundant, daisy-like, bright ruby-rose flowers with large sunny yellow centers. The plant is abundant in North America; and is easy to grow, long lived, brings cheerful fall color and is a great source of nectar for butterflies. It typically grows up to 3-4 ft. tall (90-120 cm) and 18-24 in. wide (45-60 cm). 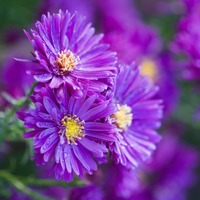 The plant features masses of sumptuous, large, lilac-blue flowers, 2 in. wide (5 cm), with sunny yellow center disks. The plant is native to North America; it is easy to grow, long lived, brings cheerful fall color and is a great source of nectar for butterflies. 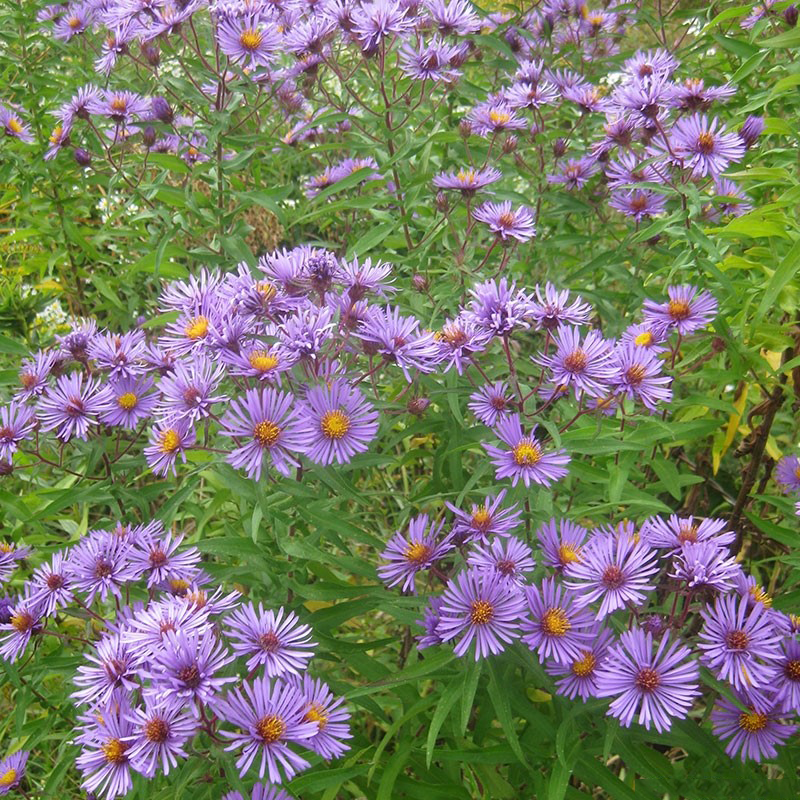 This spectacular New England Aster variety, ‘Violetta’ (Aster novae-angliae) features masses of rich violet-purple daisy-like flowers with golden yellow center disks, which can fully cover the plant. The plant is native to North America, and is easy to grow, long lived, brings cheerful fall color and is a great source of nectar for butterflies. It typically grows up to 4-5 ft. tall (120-150 cm) and 3 ft. wide (90 cm). 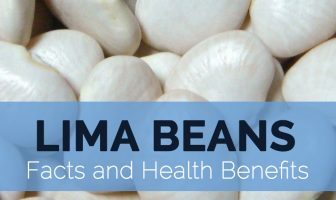 Decoction of the plant has been used in the treatment of weak skin. Poultice has been used in the treatment of pain, fevers, and diarrhea. Root is analgesic, astringent, expectorant and febrifuge. Ooze of the roots has been sniffed in the treatment of catarrh. Decoction of the whole plant has been used in the treatment of all kinds of fevers and in the treatment of weak skin. Cherokee use a poultice of the roots for pain, an infusion of the roots for diarrhea, and sniff the ooze from the roots for catarrh. Cherokee also take an infusion of the plant for fever. It is slightly astringent on the tongue, making the mouth feel dry. Chippewa smoke the roots in pipes to attract game. Iroquois use a decoction of the plant for weak skin, a decoction of the roots and leaves for fevers, the plant as a “love medicine”, and an infusion of whole plant and rhizomes from another plant to treat mothers with intestinal fevers. Meskwaki smudge the plant and use it to revive unconscious people. Prairie Potawatomi use it as a fumigating reviver. 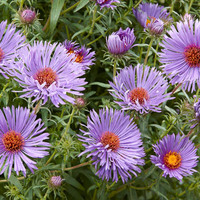 New England Aster can be used for dying fabric. Entire plant is aromatic, resinous, and sticky to the touch when crushed. 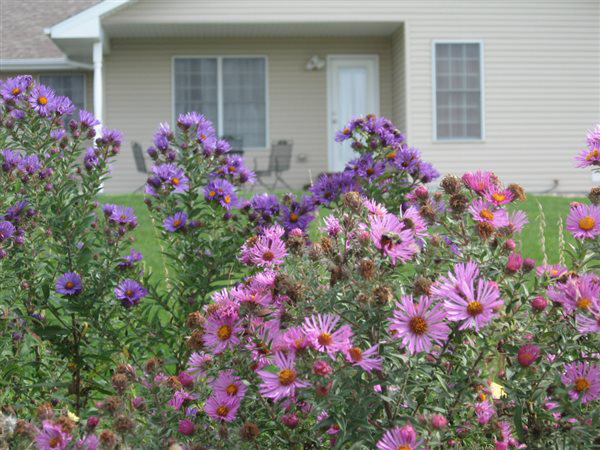 It is considered vital ingredients of late summer and fall borders, cottage gardens, prairies or butterfly gardens. 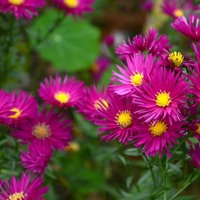 New England Asters are valued for the excellent quality of their cut flowers. Flavor/aroma Somewhat reminiscent of turpentine, when crushed. Flowers can be eaten fresh and added to a salad. Add dried plant to salads, main dishes or make a cup of tea. 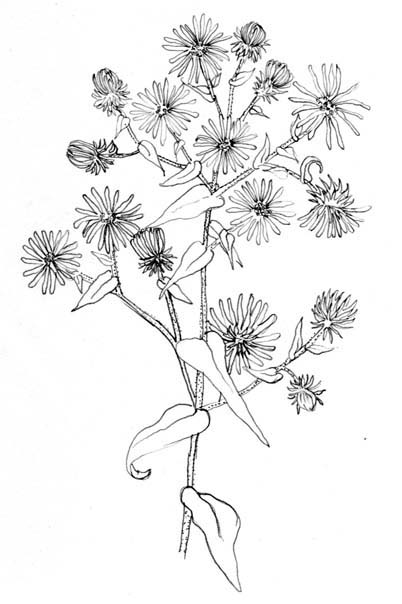 Aster novae-angliae var. roseus (Desf.) DC.